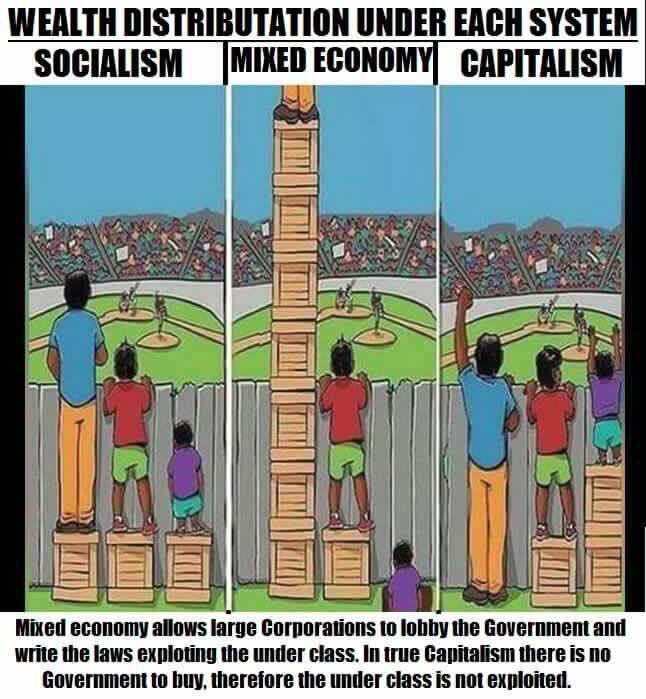 1) an economic system in which investment in and ownership of the means of production, distribution, and the exchange of wealth is made and maintained chiefly by private individuals or corporations, especially as contrasted to cooperatively or state-owned means of wealth. The emphasis in this definition must be placed on private individuals. This is the only moral and humane system I can conceive of. Who better to manage the production, distribution, and management of wealth than those who have the most invested and who have their livelihood and that of their families dependent on its success? It unreasonable to assert that if individuals are inherently corrupt, that we must therefore place power in the hands of political predators, who pay no price for their bad decisions, to manage and regulate the corrupt multitude. If individuals cannot be trusted to govern themselves how can we assume those who vie for the throne of power do so out of magnanimity and can govern 300 million people? It is much more likely that those who are attracted to positions of power are the vile scum who, due to their incompetence at providing value in the market that others would willingly patronize, instead seek to control, subjugate, and dominate peaceful individuals engaging in voluntary consensual trade. This is not Capitalism. This is Statism AKA Corporate Fascism. At its very basic level, Capitalism is peaceful people engaging in voluntary consensual trade. Wherever this exists, there is Capitalism. Incidentally this is also compatible with Anarchy, since any State that seeks to involve itself in this thing of beauty will distort and pervert the natural self-regulating market forces of competition, price mechanism, and supply/demand. This results in many mutant forms of Statism, which include Socialism, Communism, Corporatism, and Fascism. Posted in Central Banking, Government, Voluntary Anarchy and tagged Anarchy, Capitalism, Free Market, Freedom, Government, Legal Plunder, Liberty, Non-Aggression, Property Rights, Self-Ownership, Sovereign Immunity, State, Statism, Voluntaryism.